Dr. Iovine is trained as an Infectious Disease specialist and as an expert in innate defense against bacterial infection, with a focus on Gram-negative organisms. 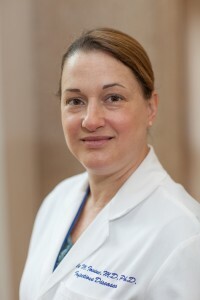 As an Infectious Disease specialist, she is interested in treatment approaches to multidrug-resistant Gram-negative infections. As a researcher, she studies the innate defenses against these types of infections. The research in her lab focuses on understanding the relationships between innate immunity and Gram-negative bacteria. One of innate immune defences studied in her lab is autophagy, a eukaryotic process by which host cells sequester intracellular bacteria within unique, double-membrane-bound compartments that effect bacterial killing after fusion with lysosomes. One of Dr. Iovine’s research projects seeks to identify novel virulence factors in enteric bacteria which mitigate autophagy-dependent killing, using bacterial mutagenesis and autophagy/invasion assays. Dr. Iovine is also studying how a SNP in an essential autophagy gene that confers an increased risk of Crohn’s disease may also lead to abnormal handling of bacteria and/or cytokine production by phagocytes. This is a collaborative research project with Dr. Sarah Glover of the Division of Gastroenterology, Hepatology & Nutrition. She is also examining the role of a recombinant, neutrophil-derived human cationic protein called the Bactericidal/Permeability-Increasing protein in the killing of patient isolates of multi-drug resistant Klebsiellapneumoniae, Acinetobacter baumannii and Pseudomonas aeruginosa and other Gram-negative pathogens for which limited clinical therapies currently exist.